Are college costs the next bubble? Are municipal bonds the next bubble? Is gold the next bubble? Are auto loans the next bubble? Are soap bubbles the next bubble? Are iphone contracts the next bubble? Are Snuggie blankets the next bubble? Lately a lot of people are trying to predict the unpredictable. Or maybe they are just bringing notice to the obvious. In either case people ask the question : "Is [insert thing] the next bubble?" about various things. You can question if anything is a bubble and it seems that people will agree with the possibility. Who can prove that something isn't a bubble? Part of what makes a bubble before it bursts is irrational denial over the value of the commodity. We don't seem to know if something is a bubble until after it pops. That kinda makes sense cause if we all knew it was a bubble we wouldn't keep buying the stuff and it wouldn't necessarily become a bubble in the first place. 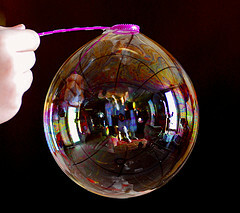 Bubbles are generally marked by irrational behavior by the market. If you know its irrational you generally don't do it. "Minsky identified five stages in a typical credit cycle--displacement, boom, euphoria, profit taking and panic"
You can see these stages in previous bubbles. The Internet technology stock bubble had each stage for sure. First the internet and internet stocks come out and people catch on to buying these new fangled money cow's called .com companies. (displacement) Then everyone who has money to invest is buying .com companies and everyone looking to start a company is starting internet related companies and taking them public. (boom) At the peak of the internet boom any company with .com in its name is instantly valued at ridiculous levels even though it has never made a profit and their business plan is written in crayon with lots of ??? 's inserted in the middle. (euphoria) Then it all crumbles and people start to sell off (profit taking and panic). You can see this in hindsight but not necessarily while its happening. I distinctly recall sometime in the late 90's a coworker saying "it can't go on forever" and at the time I honestly didn't see why it couldn't go on forever. I was still stuck in euphoria and my coworker was moved on to profit taking. He was right and I didn't see it. It isn't really until step 5 'panic' and afterwards when a bubble is widely identified. Of course there are some individuals who will point out a bubble before hand, but they are a minority opinion and they are not proven yet in their view. There are always naysayers at any time so its hard to tell if they are right or just pessimists. How can we tell if a bubble is a bubble before it pops? Thats the tricky part. But there are some tell tale signs. In hindsight we can see these signs in certain well known bubbles. Internet stock prices increased rapidly, trading in them increased rapidly and the pricing was irrational. Increasing prices and increased trading are the easier signs to spot. But what do those mean? Just because prices go up does not mean something is in a bubble. There are a lot of things where prices go up considerably over time yet this is still rationally priced. Prices generally go up gradually over time with inflationary forces. If prices go up rapidly (far faster than inflation) then that can be a sign of a bubble, but very fast price increases alone doesn't make a bubble. Prices may go up and down for a variety of reasons that are not caused by any kind of bubble. The price of a bushel of corn could go up 40% over a couple years due to a bad harvest due to weather and increased oil prices. But that isn't a bubble. Its a fluctuation in prices due to environmental changes. There was nothing irrational about the price increase and it was a direct result of supply and demand. Tickets to the original Super Bowl were $6 and today the face value is typically around $500 and up. Thats a 8% annual inflation rate. Is there any question why Super Bowl tickets have gone up so fast compared to normal inflation? Its simple supply and demand. Lots of people want to go to the Super Bowl and theres limited seating. This is the hard one to spot. If people thought the prices were irrational then most people would not be buying the thing in question. In hindsight it did not make sense for real estate to go up 10-20% a year in some markets, but at the time people rationalized it to themselves. Many people consider the cost of college to be irrational but many other people consider the cost of college perfectly rational and well worth the cost given the value received. You may or may not think that the increase in spot prices for gold is rational. To try and get a better grasp if prices are really 'rational' or 'irrational' you have to ask if the pricing is based on normal and realistic valuations. It is easier to spot rational prices versus irrational prices if you understand the good or service and see the causes for the price increases. We can all understand why corn prices go up after bad harvest and we realize that Super Bowl tickets fetch high prices due to high demand. But when the situation is more complex or the reason for price increases are not straight forward it is harder to know if the prices are really rational or not. One question to ask is : Would you pay the price asked today if you don't expect it to increase in the future? Often times bubbles are speculative in nature so people are only buying it because they think it will go up further in the future. This was true for internet stocks and real estate. People didn't buy internet stocks based on the business fundamentals of the company, instead they bought it as a bet that anything .com related would magically turn into piles of cash. People didn't buy over priced homes because they wanted to live there for 30 years, instead they bought it with an expectation that it would be a good investment due to ever increasing housing prices. On the other hand people will pay $500 or more for a Super Bowl ticket today regardless of what the price was last year or what it will be next year. People will pay up to $50,000 a year to go to college in order to obtain a high quality education. High profit margins do not equate to irrational prices. There are many commodities and services that have very high profit margins yet nobody questions as being a bubble. There are other things with lower profit margins that people assume are bubbles simply due to high sticker values. Bottom Line: Spotting a bubble before it pops is very difficult. Don't assume that high prices or increased prices are the sign of a bubble. But if prices go up fast, trading increases and there doesn't seem to be good rational justification for the prices then it might be a bubble.